A clementine is a hybrid between a mandarin orange and a sweet orange. The exterior is deep orange with a smooth, glossy appearance. Clementines are similar to tangerines and tend to be easy to peel. It is sometimes called a Moroccan clementine. A 3.5-ounce serving of clementine segments contains about 12 grams of carbohydrate, 200 calories, 9 grams of sugars and 2 grams of fiber. 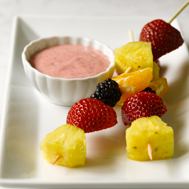 It also provides about 60% of the daily recommendation for Vitamin C.
Recipe for Tangy Fruit Skewers With Yogurt Dip from our Dessert recipe section.